Hähnel is to launch a miniature version of its recent Modus 600RT Mark II flashgun. Shown at Photokina 2018, the flashgun with have a Guide Number of 36 (m/ISO100) - but will still have the wireless transmitter and receiver of its award-winning bigger brother. It will also have its own rechargeable battery, and mini USB charger – which are smaller than those used on the 600RT. Rather than having a traditional focus assist feature like the 600RT, it will instead have a built-in LED light. This will be useful for video, as well as for helping AF in lowlight. A design feature of a coloured ring around the flash head to signify the camera system that the speedlight is compatible with. It will be available in Canon, Nikon, Panasonic/Olympus (MFT), Fujifilm and Sony versions. 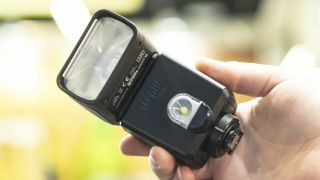 The flash has a rotating and tilt head, and incorporates a pull-out wide-angle diffuser and a bounce card. It has the same quick-lock mechanism introduced the the recent Modus 600RT Mark II update. The Hahnel Modus 360RT will go on sale in January or February for around £160 for the flashgun alone. Kits with a Viper TTL radio trigger will also will be available, as will Pro kits with two 360RTs and the Viper TTL.